I always thought it was a crazy idea to let any random person who felt like it open their own school but the reality has proved even more strange than I expected. It doesn't even seen surprising any longer that there is a plan to open a free school in a football stadium (Tottenham Hotspur) run by an academy chain backed by the owner of carpetwright. In fact this seems to be one of the more sensible proposals. 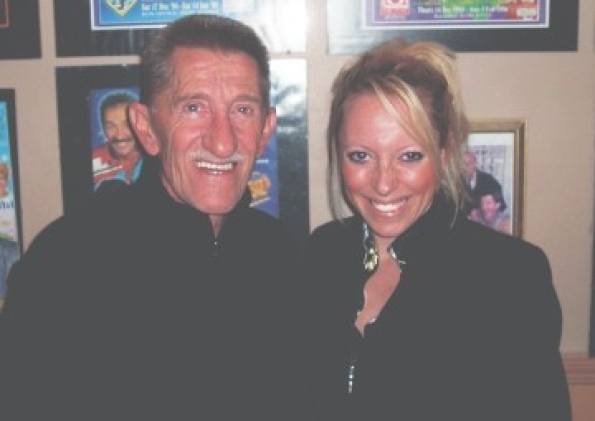 Blencowe refuses to comment on reports that the school will now not open and Barry Chuckle says that she "had not spoken to him about the planned free school recently". She claims that the "Future Access Schools Trust" will contact the paper although this seems somewhat strange as the Trust is actually registered at her own residential address. The school website has also vanished. “There is a cover-up going on regarding this ghost school. It does not reflect well on Whitehall that this process has been allowed to go on and on." 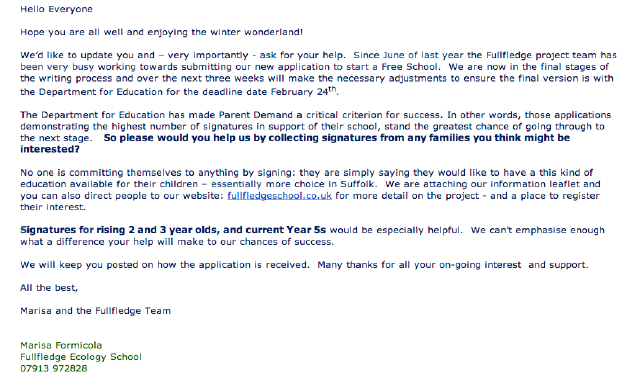 Today in Suffolk the proposed Fullfledge Ecology School is trying to drum up the required "parental demand" for its Woodbridge based all through school. Although it is a bit hidden away it is apparent that this is really a Steiner School, a Suffolk teacher has written a detailed blog post about the school and the Steiner approach if you are unfamiliar with it. Provide evidence of demand from parents with children of the relevant age for each new year group in each of your first two years of operation. 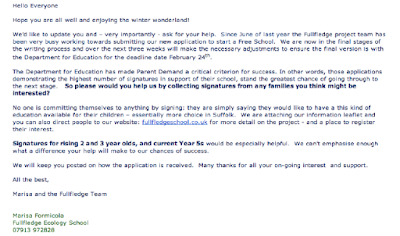 Include confirmation from parents that they would select your Free School as the first choice for their child. "no one is committing to anything by signing: they are simply saying they would like to have this kind of education available for their children - essential more choice in Suffolk"
This is hardly confirmation that parents would select the free school as their first choice. This seems a trick that several free school proposers are using.